Tomorrow I’m off to Washington, DC for the Smithsonian Folkways Festival. Held on the National Mall (even in this heat wave), one of the three themes of the Festival is “Creativity and Crisis”. It’s a look at the global response by the arts community to the AIDS epidemic. There will be performances by people from Chicago to South Africa. There will be presentations by those who have made it their life’s work to use the arts to educate the world about AIDS. 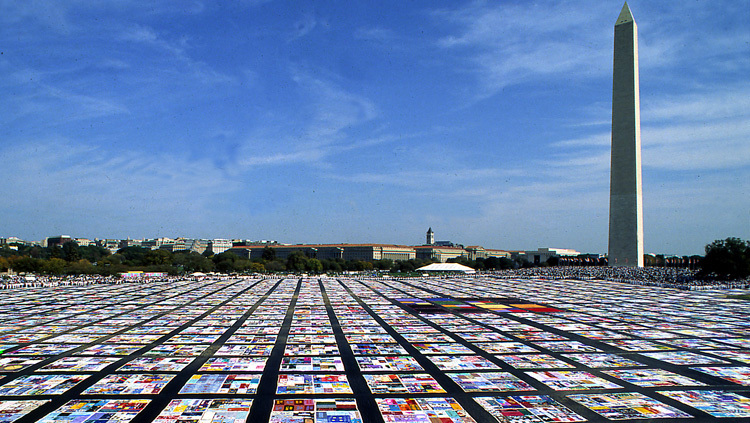 And the 25th anniversary of the Names Project’s AIDS Quilt will be observed. Between now and the end of the International AIDS Conference later this month, 55 locations in the Washington, DC area will display some of the 48,000 panels that makes up the Quilt. Over 91,000 names appear. Its size – never anticipated – prevents its display in any one location. But several thousand panels will be on display each day during the Festival on the Mall. I haven’t seen the Quilt for 20 years, when it was displayed at Chicago’s McCormick Place convention center. I went with a friend, and we sought out names of people we’d known. In many ways, visiting the Quilt is like visiting the cemetery: it exists to preserve the memory of people who died. But with a big difference: the panels are much more personal. My father, a veteran, is buried at a military cemetery. Until recently, only name, rank, branch of service, birth and death dates were inscribed on the headstones. But now family can add little messages, personalizing them like the headstones at civilian cemeteries. The panels of the quilt, to a much greater extent, reflect the personalities and lives of those they honor. Some are soft and gentle, others are bold and loud. The ones for babies are especially touching. Some of the panels were made by strangers, volunteers who followed the survivors’ wishes. Some of the panels were made by family members. Many of the panels were made by friends, people who functioned as family at a time when people with AIDS were shunned by their relatives, their churches, their countries. Some of the friends who made panels now have their own. I’ll be blogging, tweeting and posting on Facebook while I’m there this week, with a wrap-up next week on how grieving friends created something that is truly remarkable. Click here to find out more about the Smithsonian Folkways Festival. Click here to find out more about the Names Project.